10. When the chores aren't done - Nothing bugs me more than realizing I'm picking up after someone who is chilling on the couch with a book. 9. When the homework isn't done - The only problem is that sometimes the homework IS reading and then we parents haven't got a leg to stand on, here. And that's OK.
8. When they're eating - Unless you own the book this is just a bad idea with expensive consequences. 7. When they're in the tub - See #8. The exception being those special baby bath books which are pretty lame anyway. 6. When I've turned off the light five times already - Look, kid. I get that you want to finish the chapter, but I'm telling you that it is WAY past your bedtime and I know that this chapter is only going to end in a cliffhanger; just like the last one did. 5. 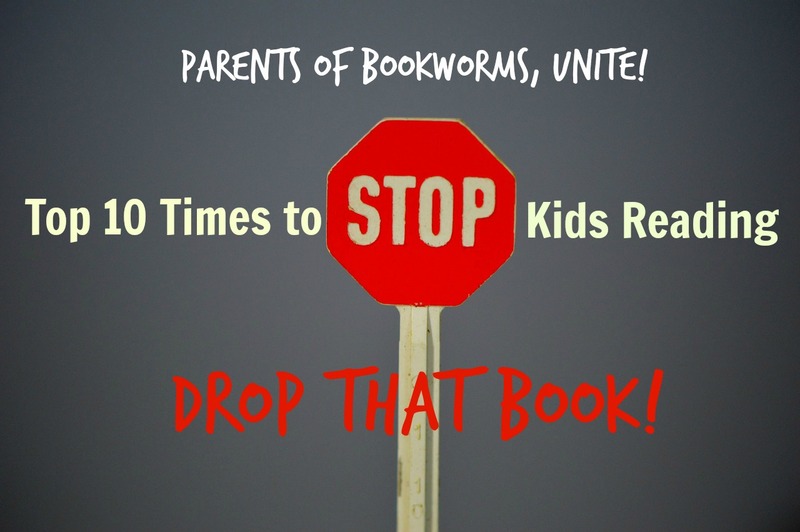 When they're in the car, feeling queasy- I'd much rather confiscate your book and hear you complain than clean up the contents of your stomach. 4. When we're eating a family dinner - Talk to me about what you're reading, ask me about something in your book you didn't quite understand, or just stare into space thinking about the plot. But, if you sneak a book into your lap, don't play dumb when I call you out. 3. When we're in church - Unless it's a church book, you'd better leave it out in the car. We are not here to worship the latest best-seller. 2. When the book is overdue - Renew or relinquish! I'm not planning on paying your fines if you don't let me take it back to the library. And I'm leaving in five, four, three, two . . .
1. When they're not dressed - Are you kidding me? First things first. You are not allowed to lounge around in underwear (or less) reading! Even Harry Potter was at least wearing a robe. Oh man that was fun to write. And yes, I did have to deal with #1 today! Related: More parenting posts here on Everead. This is great stuff, Alysa. As a sufferer of motion sickness, I especially related to #5 (though luckily I did not have this problem when I was a kid - we drove from MA to FL, and I read the whole way). Haha! Thanks, Jen! I can read when we're on the highway, but if I try to read on surface streets I definitely feel it.